The Spice Girls’ determination to get 4 out of 4 singles to Number One – breaking a long-standing record – means this package heaves with reasons to buy. Not just a double A-side, not just a Comic Relief charity record, the single came out the week before Mothering Sunday. It’s remarkable nobody had thought of this trick before – or maybe they just didn’t have the songs. “Mama” is the first Number One since St.Winifred’s School Choir to be designed as a present for an older relation – a chilling precedent, but the Spice Girls sniff out a better angle than just sap, tingeing their sentiment with a regret for past filial beastliness. That – and the pensive flute figure that breaks up the cotton-wool arrangement – make “Mama” waft past in a pleasant haze, not a cloying one. If our putative Mum flipped her present over, she’d find no less welcoming a track – “Who Do You Think You Are?” picks up the music of her youth and offers a bustling, aerobic take on it. The Spice Girls’ first big step into mining pop styles for pastiches, it’s an efficient, off-the-shelf version of disco: big on the horns and wah-wah, light on the glamour or romance. Established as the dominant group in British – perhaps even global – pop, and with still no viable domestic rivals, the Girls used pastiche to assert their heritage. 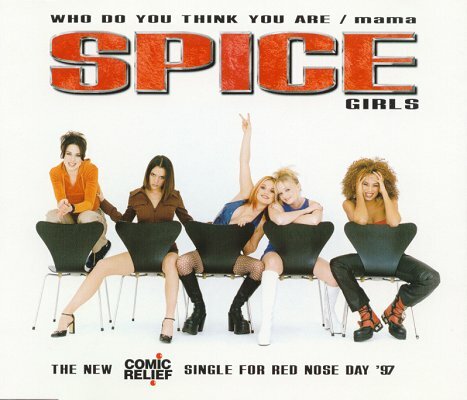 Many of the their singles from here on constitute a tour of pop’s histories and geographies, with some album tracks – like Spiceworld’s big band workout – extending their arc even further. Since there wasn’t a consistent modern Spice sound to delve back from, this shouldn’t have mattered: the point of the group was always the group, and the Spice Factor in their singles so far has been a matter of attitude – camaraderie, self-assertion, and good advice. On “Who Do You Think You Are?”, the group come together with force and gusto on the chorus, but the verses are the Spice Girls at their most disconnected yet, trading lines and aphorisms as if they’re in competition. On their first singles, force of will, fizz, and inspired musical choices have deflected any criticism of the somewhat kit-built production. But “Who Do You Think You Are?” is consciously generic disco, which means no inspired or even unusual choices, so the stiffness and cheapness of the sounds have nowhere to hide. It’s a single with the dancefloor imperative of disco, but none of its style or cheek. The mix of vocal personalities, and the drive of the chorus, keep things compelling – and the wistful “Mama” is “Who Do You Think You Are”’s perfect foil – but this is as close as they’ve come to a mis-step. Or, they just needed a two syllable word for Mum, so that it would scan properly and didn’t want to use Mother. two days after ‘Who do you think you are?’ hit Number 1, John Major announced the General Election of 1997. A coincidence? So why not “Mummy”* (or “Mum, dear” or “Dear Mum”). * see Supertramp (1979), Wham! (1983). My suspicion is it’s the two syllable thing and they wanted something which was trans-Atlantically applicable – “Mama” ducks the Mum/Mom problem. As for WDYTYA, I have to agree with those who have commented on its disco-by-rote arrangement, cheap sound (esp. that tinny Tesco Value “horn section”) and structural awkwardness – that leap from the bridge to the (weak) chorus is none too smooth. But the song would probably get away with all the above if it weren’t for Geri Halliwell; as Cumbrian said earlier, it was a mistake to let her take the first lead on this or any other track. She stinks the place out, going off-key in the very first line and employing a series of overwrought inflexions in an attempt to mask her vocal limitations and sound ‘sassy’ (“as long as you’re GETT-TENNNGG”). Her performance here prefigures bunnied horrors from her solo career and amply demonstrates that she, not Posh, had the worst singing voice of the five. There have been at least 10 original* UK Top 10 hits, by UK artists, including 3 number ones, using the word “Mama” in the title**. Having lived in the UK for a few decades, I can’t recall anyone I’ve never known anyone*** using the term “Mama”, either to address their mother or as part of an interjection – so I conclude it’s clearly been imported into the language of UK Pop, but not into everyday speech. By contrast, there haven’t been ANY Top 10 hits by UK Acts to use the words “Mum”, “Mam” or “Mummy” in the title – but pretty much everyone I’ve ever known has referred to their Mum by one of the three. “Mother”**** afaik has just been in the title of just one original* UK top hit by a UK artist. Why is this? It’s because, as you say Tom, even the most British of pop often yearns to be Trans-atlantically acceptable. Maybe that’s fair enough, but I find it pretty objectionable in the case of “Mama I love you, Mama I care”. If I said that to my Mum, my Papa would tell her not to speak to her like that. ** as others have pointed out, there’s plenty more in lyrics, rather than titles. *** no, it’s not a small sample, cheeky, and I went to very multi-cultural schools prior to age 11. **** which appears very occasionally in interjections and infrequently as a form of address. ‘Bohemian Rhapsody’ is unique, I’m sure in name-checking three future number ones in its lyrics: Mama, Mamma Mia and Figaro! Finally, the reason why Orbital’s “Satan” didn’t get to #1. They should have named it “Beelzebub”. There are no words for things like this..
Haha. I don’t, I know these lot well. Only 20 miles down the road from Clitheroe.. this MUST be the origin of Papa Lazaru et al! “Mama” is too treacly and twee in my book. And its insistent, anodyne aural assault reminds me of the brainwashed ants in The Once And Future King approvingly droning about “that Mammy-Mammy-Mammy song” for being so “Done”. As for the A-side, that’s just bland and unmemorable. I never really liked the Spices and this is about as good as they ever got. 2 (3, if I’m generous). For what it’s worth, “mama” is a fairly common word in various European languages. It’s used in my native language, Bosnian, and it crops up in French (as “maman”) and German too. So if they did use that particular word just for the marketing potential, it may have been a more global concern than just chasing the US market. Just discovered – late, I know – Smokey Robinson and the Miracles’ spectacular ‘Shop Around’, possibly the ur-text of Mom/Mum Pop. Like many of Robinson’s greatest songs, the lyric is particularly brilliant in the way it plays with the idea that he’s an unreliable narrator. Are we meant to believe that his mum really told him to “play the field for as long as you can”? Maybe, maybe not.